West Monroe, LA – Superlift now offers a premium mild lift system for DS-platform (2009-current) Ram 1500 4x4s. The new kit features gas-charged Bilstein front struts, which have five incremental height settings: no lift, .7″ (maximum setting for Outdoorsman and TRX4 Rams), 1.4″, 1.7″ and 2.3″. 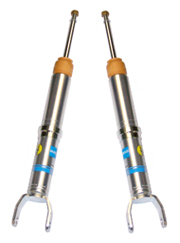 These struts can also be used as premium upgrades with Superlift’s 4″ and 6″ lift kits. An optional rear kit levels the truck with 1″-2″ of lift (depending on model) using high-pressure-monotube Superide SS shocks by Bilstein in addition to dual-rate coil springs, compression-stop extensions and all required component-relocation corrections. Maximum recommended tire height with struts on their tallest settings is 34×12.50. A Level-It 2.5″ spring-spacer lift is also available, as are full 4″ and 6″ lift systems for 2009-current Ram 1500s.